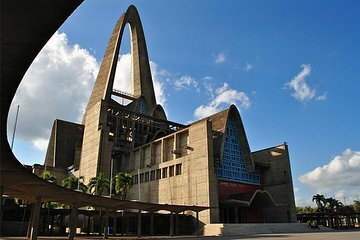 Veja uma das igrejas mais antigas das Américas e visite a Basílica de Nossa Senhora Altagracia neste popular passeio de Higuey saindo de Punta Cana. Experimente a beleza desta paisagem colonial e siga o seu guia especializado pelas ruas da cidade, áreas residenciais e marcos importantes enquanto aprende sobre a cultura, as pessoas e a história que tornam esta cidade única. The Higuey Cultural Tour from Punta Cana was very educational. The guide Antonio was knowledgable, kind, and provided a wonderful experience. Elvis our driver was very safe. The tour was as advertised. We highly recommend this tour if you are interested in learning about the culture of the Dominican Republic. It was a highlight of our vacation. Learned so much culture and history. Antonio, the tour guide was so personable and answered all questions we had. We had an air conditioned van. Provided cold water and soda. I would recommend this to anyone! This was a wonderful tour for adults. Had fabulous tour guide, Antonio. We toured a plantation - very interesting. He told us about every little town we went threw. This is a excellent tour for adults. We had an outstanding tour guide, Antonio. The plantation part of The tour was great. He told us about every town and the people who lived there. His knowledge of Punta Cana part of the Dominican Republic was outstanding. We also had a guide at the Very large and unusual Church in Higuey. He was very good. Our bus was outstanding and the driver was great. Well worth the money. Muy buena combinacion entre la manera de vivir en una granja y la faz religiosa de la colonia y la actual.El guia excelente. The tour guide and the driver were great. The tour guide was very knowledge and showed us a wonderful pat of Punta Cana. The family we visited was also wonderful. The churches were amazing. My only suggestion is to have the Church tours shorter. By the time you see them we were very tired. This tour was a wonderful cultural experience about life in the Dominican Republic, as narrated by our wonderful tour guide. He pointed out places of interest and gave geographical and historical information to us as we drove along the countryside to each stop on the tour. The visit to the Cocoa Farm and churches were both informative and meaningful delivered by the locals. Our tour guide, photographer and driver were very friendly, professional and seem to love their jobs. Our large group of ten were impressed with the church tours and learned the history of these from the perspective of the locals. The moved us along in an orderly, but unhurried fashion, and even allowed us to enjoy a short shopping trip. I highly recommend this tour and know you will enjoy every minute of it. I thoroughly enjoyed this tour! The Sol Cana Tours team gave me and my group of 8 friends a wonderful experience. Antonio was very knowledgable about the culture of the Dominican Republic and his enthusiasm about sharing it with others came out in his presentation. Joel, the driver, was a very good one and we all felt very safe as we traveled through the countryside. If you like to experience the culture of the place you are visiting, I would highly recommend Sol Cana Tours as your tour company. The tour was so informative! The guide was great!! We learned so much!